Joseph Gordon-Levitt plays Wilee, a New York City bicycle messenger, who gets a package to deliver that turns out to be prized by the bad guy and the film is Wilee fleeing from the bad guy while trying to carry out his duties of delivering the goods. I laughed out loud. I could label this "bicycle parkour" and that means I'm watching something I haven't seen before. In this day and age you would wonder how anybody, absolutely anybody, can come up with something I haven't seen. I don't mean I'm jaded, I just mean that sooner or later you have to come to the end of the line. Doesn't it stand to reason there are a finite number of possibilities? David Koepp directed the film and co-wrote the screenplay. The name might not mean anything to you but the names of the films this gentleman has been involved in have very much been the public eye: Mission:Impossible, Jurassic Park, War of the Worlds, Spider-Man, Indiana Jones and the Kingdom of the Crystal Skull, to name a few. According to Box Office Mojo, Mr. Koepp currently sits at number five on the list of the currently most successful screenwriters. Parkour (abbreviated PK) is a physical discipline of movement focused on overcoming obstacles. Developed in France by David Belle, it is a method of training the human body to become stronger, more agile, and faster, while remaining efficient and able to move more freely. Participants learn to pass diverse obstacles by combining a variety of movements like running, climbing, swinging, vaulting, leaping, and rolling. It uses no equipment and is non-competitive. From what I've seen, this sport seems to take place mainly in an urban setting. And that is the connection back to the film but here, my joke is that we're doing similar stuff but on a bike. Yes what goes on in the film are controlled stunts but oh what stunts we have. I don't remember doing any of that stuff on a bike when I was a kid. Holy Hannah! It is interesting in this day and age of electronic communications, bike messengers continue to thrive. Yes, somebody needs original documents with signatures but is this old school? I have personally run across the new trend of scanned documents being accepted as legally binding. Somebody emails me a PDF of a document. I print it, sign it, re-scan it then send that PDF back. It's all legal. Will someday the era of bike messengers be considered part of our folklore? I have heard tell that actors who get their start in television do not necessarily make the transition to films. If your size equates to the "box" does that make you too small for the "big screen"? People, people, people, do not get up when the credits start rolling or you're going to miss something. During the production, Joseph Gordon-Levitt was apparently cycling too fast and ran into the back of taxi, flew off his bike and slammed into the rear window of the car. He slashed his arm and ended up needing 31 stitches. During the credits, they show a short video clip of the taxi, the smashed window and Mr. Gordon-Levitt's cut arm. It does make you wonder just how many times bike messengers are hurt and to what extent. Riding like a maniac through the maze of vehicles and pedestrians in the streets must be an adrenaline rush but also a tad suicidal. I enjoyed the film. I smiled at the bicycle stunts but laughed out loud at the quick mental calculations about how to get around New York. Wilee would arrive at a busy corner and the movie would then show Wilee eyeing the scene to figure out the best route: veer to the right and get hit by a car, veer to the left and run into a woman with a baby carriage or shoot up the middle and successfully navigate through the cars. That was quite amusing. Sidebar: Aasif Mandvi has a supporting role in the film but I best know him as one of the regular correspondents on The Daily Show. A glance at the Wikipedia article about him shows that he does have something of a film career in supporting roles. A movie about bicycle messengers may not be at the top of your list but I did find the film entertaining and the bicycle stunts were novel. I'm not advising you to fork over the small fortune necessary to go to the theatre but sometime in the near future if this pops up as a rental, I think you'll find this to be an engaging hour and a half to go along with your bowl of popcorn. It's built out of familiar parts, but no matter how formulaic Premium Rush's storyline might seem, it's elevated by high-octane action and enjoyable performances. 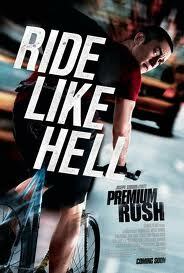 Premium Rush is a 2012 American action film directed by David Koepp and written by Koepp and John Kamps. The film stars Joseph Gordon-Levitt, Michael Shannon, Dania Ramirez and Jamie Chung. Set around a bicycle messenger who is chased around New York City by a dirty cop who wants an envelope the messenger has, it was released on August 24, 2012, by Columbia Pictures and received positive reviews from film critics. David Koepp (born June 9, 1963) is an American screenwriter and director. Koepp is the fourth most successful screenwriter of all time in terms of domestic box office receipts with totals at just over $2 billion. Partial list: Jurassic Park (1993, with Michael Crichton), Carlito's Way (1993), Mission:Impossible (1996, with Robert Towne), Spider-Man (2002), Indiana Jones and the Kingdom of the Crystal Skull (2008, screenplay from story by George Lucas and Jeff Nathanson).